By using the golf cart paths you have some easy access to the meadow without getting the bride and groom all dirty in the early season when it's a wet mess. With that in mind the couple decided to stay on the path and practice their first dance. This is always a good one because the photographer can get more candid portraits by doing this and the couple gets some practice in before the real deal. 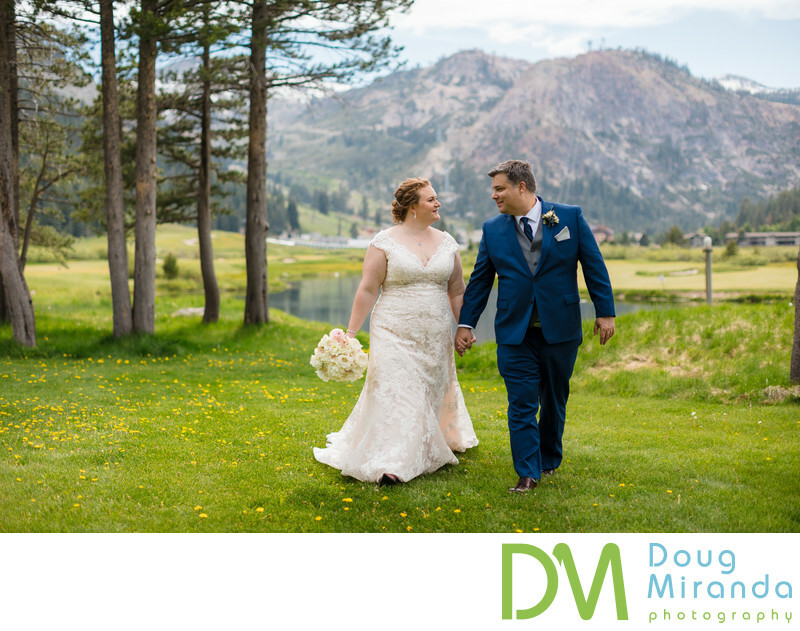 The Resort at Squaw Creek is one of the premium wedding and event locations in Tahoe, Squaw Valley, and the Sierras. 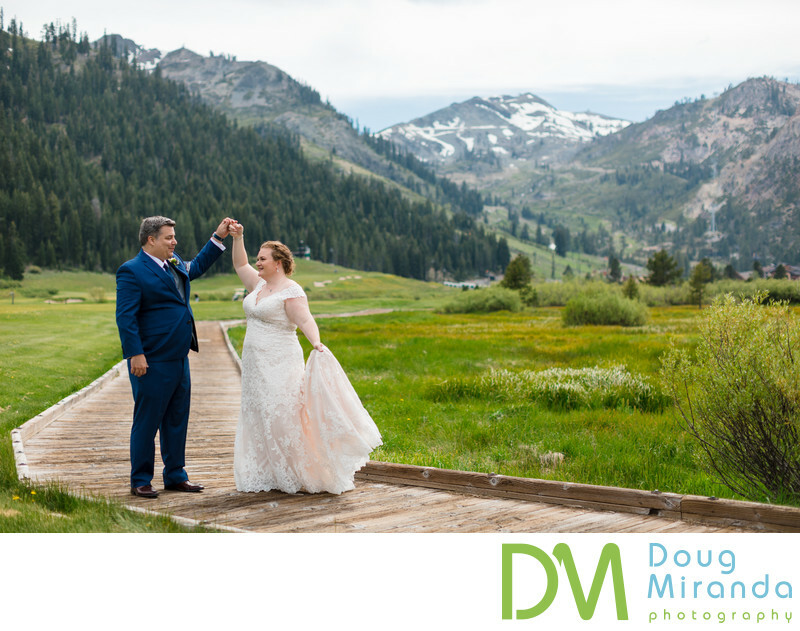 This grand hotel and event center is settled in the woods of Squaw Valley California with epic views and access to the surrounding mountains and meadows. The resort offers ski in and ski out services and in when the snow is gone it has 18 hole championship golf course for your guest to play on. Wedding ceremonies can take place at three different locations depending on the how many guest you have and which location fits your style and needs. The “Spa Deck” as views of the valley floor and mountains with a stone fireplace to add to the ambience of the deck. This location holds up to 200 guest. The “Golf Course" location is situated on one of the tee boxes and is surrounded by tall trees and has amazing views of the mountains and valley. This location accommodates up to 150 guest. Lastly the “Pavilion” site is located at the base of the 250 foot waterfall that is near the pool deck and hotel. This is the largest location and can hold up to 300 guest. Your reception and dance party can be held at seven different locations on the property. The main factor in picking one is the size of your wedding. Every location is stunning and will make your wedding day one to remember. The resort has a mixture of indoor locations and outdoor locations for your reception. The wow factor to Resort at Squaw Creek weddings is it’s location. You can’t beat or find the views or pure beauty of the surrounding area at other venues in the area. The valley floor with it’s meadows and views of the surrounding mountains are just breath taking. Then you have the well manicured golf course as backdrop too. You will have many of locations to pick from on your big day to take pictures at. You will definitely not be disappointed if you choose to have your special day at Squaw Creek. A list of some of the services that they offer for weddings and events. Catering services for cocktail hour and receptions. Set up and clean up of event. Outdoor or indoor ceremony location. China, flatware, glassware and linens. Location: 400 Squaw Creek Rd, Olympic Valley, CA 96146. Keywords: Resort at Squaw Creek (15).